Establish guidelines for use of hyperlinks. Offer guidance on when to use links and when to use command buttons. Commands with significant consequences, such as final actions that are not reversible, such as "Delete" or "Run"
Long text strings, consisting of 5 or more words. These look less awkward as links than as command buttons, regardless of whether they are actions or navigation. Context -- If in a form body or a form header. example, the header better accommodates tool items than links. Mention how/when to use Command Links in preference/property pages. That's where they're used the most right now. Open project properties of a EJB project for example, open Targeted Runtimes ... click on "Uninstall Facets..." the shown dialog will be opened. 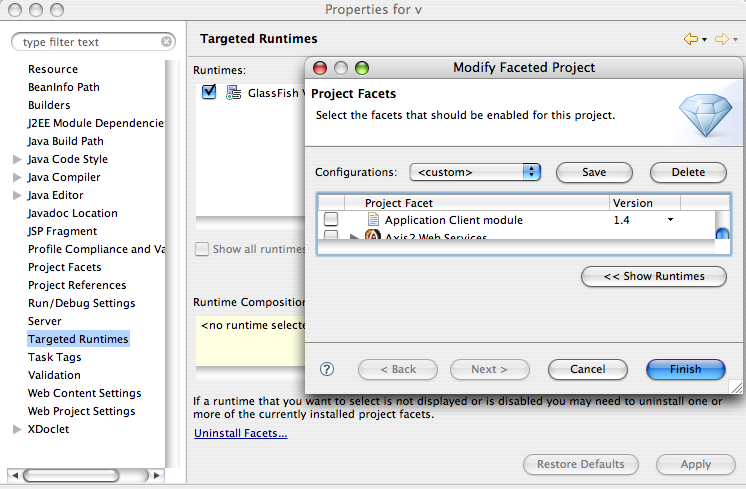 You can open the same if you go to "Project Facets" and click on the regular button "Modify..."